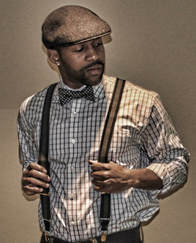 Born in 1986 in Birmingham Al, Quintan “Q” is a self-taught artist from Uniontown, AL. Uniontown has a population of about 1,600 people, where the median income for a household is $12,386. About 47.4% of the population is below the poverty line. Despite the poor condition, Q fell in love with art at a young age. His mother, Angela Collins, an educator encouraged him that he could be whatever he want despite his environment. Q graduated high school in 2004 and continued his degree in Electrical Engineering from Alabama A&M University. After graduating, he joined the United States Air Force and received his Master’s in Materiel Engineering. As an artist he always kept his art to himself. Many people inspired him to let the world enjoy this gift, he soon begun to slowly introduce his art to the world through small local shows. He is inspired by Kevin Anthony Williams (WAK), William-Adolphe Bouguereau, Leonardo Da Vinci, and David Kassan. Quintan currently lives in Huntsville AL. "Everyone wants to walk the red carpet. To be seen. To be the next best thing. No one wants to roll out the carpet. To work. To create the next best thing. I am trapped in a generation of lookers and Knockoffs. No one wants to create but instead imitate. This has become the norm. I am not normal. When my generation chooses to stop looking for the next best thing and start living in their own purpose, we might then take our place in history. We can remember those that came before, but what about our memory? What change did we encourage in the world? ​"As for me, I am Q, I have my own purpose. Living the life that was made solely for me. It doesn’t matter who I am. My face doesn’t speak for my art. My identity is found in the stroke of my brush, in the life of the canvas. I will have my place in history. I care less about a funeral, As long as my art is respected."